Here’s the thing: the avalanche has begun to roll. It can’t yet be seen, it is still a long way off, but I can hear the first mass of snow pushing its way down the slope, rumbling quietly. 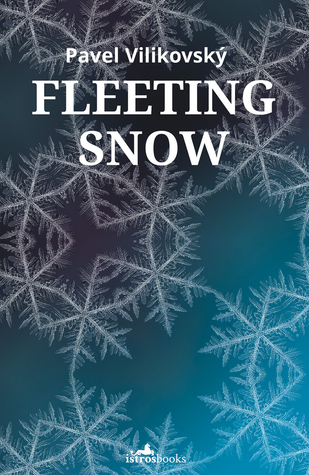 It is fair to say that Fleeting Snow, by Pavel Vilikovský, the first Slovak translation to be released by Istros Books, begins on an unusual note. The narrator promptly informs us that his original name has lost meaning for him, rather he prefers his self-declared name, Čimborazka. However, it is clear that he also seems to have affected some alienation from his own identity. His appearance in the mirror is vaguely familiar, but he questions whether he is really himself or his own step-twin. Mail arrives addressed to a name he no longer chooses to recognize and yet he has informed no one of his selected appellation. And he refuses to have a character—or a reliable, consistent way of being—and that, in itself should be our first clue. He has adopted some kind of metaphorical armour. But why? And against what? What follows, or rather plays out, is an orchestrated discourse that meanders down assorted pathways, broken into in a series of short, fragmented chapters, each conveniently denoted with a number and letter according to theme or motive, echoing a musical score. Čimborazka, we quickly learn, is given to wide ranging philosophical musings about the relationship between the body and the soul, the nature of God, the meaning of love and the limitations of the Slovak language. His digressions are, at least initially, light-hearted and good humoured. His friend Štefan Kováč, who may or may not be a separate person or an alternate self, plays the logical, scientifically grounded foil to Čimborazka’s esoteric ramblings. He is a linguist, a specialist in an extinct native American language, who challenges his friend’s flights of fancy. And then, there is the avalanche, a recurring image rolling through the narrative. If the unconventional ordering of the chapters or fragments is disorienting, one soon falls into the flow. The various themes which, at the outset appear quite disparate, increasingly echo one another. Key to the narrative central to Fleeting Snow is Čimborazka’s notion of the soul and its relation to the body. Although he spends much time wondering about the nature of God, his is not a specifically religious inquiry. He seems curiously agnostic. The soul is a useful concept—it can mean anything one wants it to mean—and for our narrator, it is that essence, produced by the body, that makes a person or a being, who they are. The soul, gives the body meaning. The soul can’t be seen because it is hidden inside the body. Strangely enough, we can’t see even our own soul, we just know it’s in there somewhere. What’s even more strange is that all of it fits into our body even though we sense that it’s somehow much bigger. That it transcends the body in every way. Likewise, another prominent theme, that revolving around language—the demise of indigenous languages, the corruption and loss of traditional dialects in Central European languages—represents an analogous relationship. Language is the soul of a culture. In both cases, when the soul starts to change, when critical features begin to disappear, what happens to the person or the peoples left behind? But at some point, not long ago, her face suddenly seemed to become more beautiful. The lines around her mouth and eyes vanished, the skin on her forehead and cheeks became tauter, had I not known her I would have thought she’d had a facelift. It happened gradually, not from one day to the next, and I also became aware of it only little by little – one day I felt that her smile lost its sarcastic edge and suddenly started to spill over like a puddle because there was nothing to hold it back; on another occasion I missed the contemplative furrows on her brow, but thought it was just a one-off rather than an ongoing process. Soon he realized that the change was permanent, as if she was showing another face or, as he would begin to see in time, another soul. Strange behavioural shifts that signaled a loss of cognitive function, forgetfulness, disorientation, and anxiety became more frequent. But Čimborazka is reluctant to acknowledge the significance. He describes himself as self-focused person and confesses that in the past there had been so much about her that he had not cared to appreciate. As she starts to slip away, he feels shame. And shame is a complicated emotion, eliciting a mix of guilt and defiance. The word love is so popular because anyone is free to make it mean whatever they like – some might see it as a fusion of bodies, others as a fusion of souls. It is the latter who usually end up disappointed… But there are moments when two souls, even if travelling in opposite directions, pass each other and exchange a friendly wave, like tram drivers who work the same route. Now I realise that all one can expect of love are these precious, fleeting moments of intimacy. But what if one of the drivers is suddenly assigned a different route? Pavel Vilikovský is recognized as one of the most prominent authors of post-Communist Central Europe. In this creatively structured short novel, he presents, in Čimborazka, a digressive, eccentric narrator, reminiscent of Bohumil Hrabal’s loquacious protagonists. The lighthearted tone at the opening belies the depth. The humour, the philosophical questing, the digressions about love and language, the pragmatic counterpoint offered by Štefan, and the metaphorical avalanche nest a complex of painful and difficult emotions that the loss of memory engenders. The result is a multi-layered story that raises many questions—the kinds without easy answers. Fleeting Snow by Pavel Vilikovský is translated by Julia and Peter Sherwood, and published by Istros Books. An excerpt can be found at B O D Y. Thanks, Joe – very thoughtful and clear: a super start to the hoped-for unstoppable avalanche of good reviews! Thanks Susan. There are so many threads running through this that could make it sound so complicated in a review and yet that is not the way it reads. It’s a very entertaining and intelligent novel! Having visted both the Czech Republic and Slovakia a couple of years ago I’m tempted to read some sort of comment on their separation into two countries here but perhaps I’m being too clever by half! Less their separation (as they are two different cultures with similar but distinct languages) but a comment on the loss of linguistic heritage and diversity that in Central Europe goes back to the Austro-Hungarian empire—and echoed in the extinction of indigenous languages in other post-colonial contexts such as the Native American. In the interview at the back of the book the author has some strong views about language and cultural memory loss. Likely all the talk of avalanche, but this brings Josip Novakovich’s Tumbleweed to mind. The essay sounds like it would definitely contribute to understanding the structural decisions made with the narrative. I also like the idea that it’s been included at the back, so that readers can discover the work first. I didn’t think of Tumbleweed, the eccentric style of the narrative is closest to Czech writer Bohumil Hrabal. But yes, the interview at the end add so much depth to the story.